Last year, I made a New Year’s resolution: Read through the entire Bible AND journal it in my brand new journaling Bible. I suppose I thought it would honor God (and I still know it would), but honestly, my motivation was ALL SHADES of wrong. I thought the promise of praise by the people around me at the completion would be all the motivation I’d need to really finish it. Sadly, that's why I set the goal in the first place. So I posted about it: Look what I'm doing, y'all! SEE! I AM A HUSTLER. Go tell it on the mountain of social media: I am someone who GETS IT DONE. Do you know how far I made it? TWO DAYS. Two. To put that into context, Adam was still blissfully running around the garden nekked. There is nothing, Nothing, ABSOLUTELY NOTHING I can do that will make God love me more. NOTHING. I didn’t really understand this at all until I had children. The five faces that look up (and now down 😭) at me everyday? There is NOTHING they can do to make me love them more. Not a SINGLE thing. Am I somehow a wiser, more loving parent than God? I doubt it. So why? Why was I hustling? I thought your approval would motivate me. I put it out there, and if you saw me as a hustler, as a goal-setter with a mountainous task ahead, the promise of YOUR praise at the end would be all the motivation I’d need. The praise of others, man. It’s POWERFUL stuff. 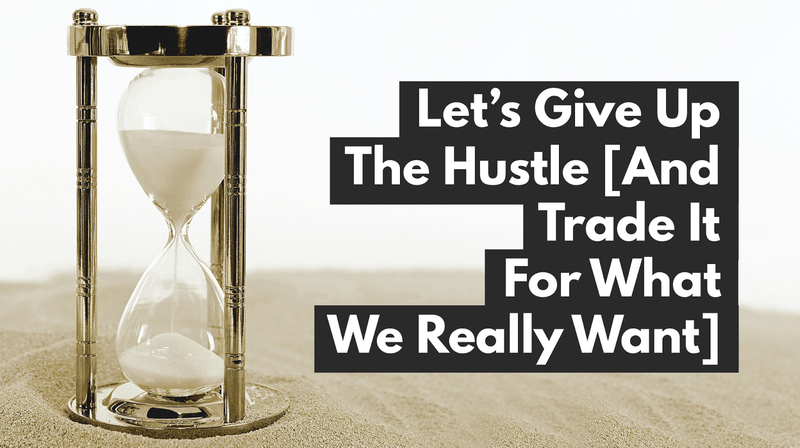 This last year, I learned that the hustle is a big time FRAUD. All the trying, all the grasping, all the scheming to somehow manufacture contentment through approval of others by a whole lot of DOING doesn’t work. The dividends are ZERO. Hustling for approval NEVER pays. What if my ONLY goal this year was to rest in the goodness of the Lord and look for ways to display that goodness to others? What if I became more vulnerable, less prideful about what I know, and became a better listener instead? What if I wrote when I wanted, NOT to get paid or get YOUR approval or AMENS or accolades, but simply because I enjoy it? What if I slowed down, honed in at home and fostered a handful of DEEP friendships instead of “managing” a host of acquaintances? What if I said “yes” to things that would build others up and love them well, and “no” to things that would do that for me? It wasn’t perfect. In fact, it was a perfectly messy, perfectly scrambled, all over the place emotionally year. Approval is like a drug, and detox is BRUTAL. I failed a WHOLE bunch because I know I’m hard-wired to seek approval. But this last year? I FINALLY gave up the hustle and traded it for a deep contentment I’d never known. A friend looked across the room at me a couple of weeks ago as we recounted what we’ve seen in each other this last year and said, “I saw a vulnerability in you I’ve never seen before.” I not only adore her, but I fought back tears that she saw what God had been secretly doing in me. You see? This kind of year was a work inside of me. Not a work to put on display. - You are not more loved because you become thinner. - You are not more accepted because you've read more books. - You are not more worthy as a friend because your schedule is packed full of lunch dates. And you will NOT be more content. I can promise you that. As we set up goals, make resolutions, determine to DO THAT THING, can I just throw out there that maybe, JUST MAYBE, this year might be YOUR year for resting? A year for waving goodbye to all the manufacturing and maneuvering and stressing over the DO THIS AND THAT so that others will love/accept/think more highly of you. But instead, focusing on finding contentment where it can be found - giving up the hustle and resting in the deep contentment that is found by fostering deep, close community and resting in the goodness of the life God has set before you. And discovering ways (within your newfound RESTED self) to show that love to your people. This just might be your year, friend. So glad to see you posting again! I love reading your blog and get such encouragement and truth from it. Thank-you!